It had been half of forever since I made cream puffs so when the mood struck the other day, I jumped right into preparations. They aren’t hard to make and are so tasty when stuffed with a delicious, creamy filling and dusted with sugar. Make a batch this weekend and see if your family doesn’t act a little bit appreciative of your efforts. Stir until it forms a ball then cool for 10 minutes. Add eggs one at a time, stirring with a wooden spoon. Drop onto a greased baking sheet (I lined mine with parchment) about three inches apart. Bake until golden brown and lovely. Set aside and let cool completely. Stir together dry ingredients, mix in milk then cook until thick and bubbly. Add milk mixture, gradually, to beaten eggs. Mix completely. 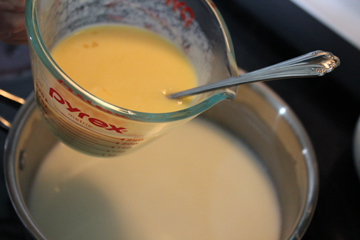 Pour egg mixture back into pudding. Cook until bubbly, but not boiling, remove from heat then add butter and vanilla. Pour pudding into a bowl, cover with plastic wrap and chill until ready to serve. 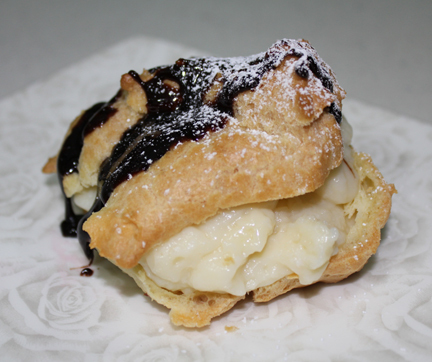 Split cream puffs open and remove any soft dough in the middle. If you are a chocolate freak like me, drizzle with chocolate before dusting with powdered sugar and devouring. 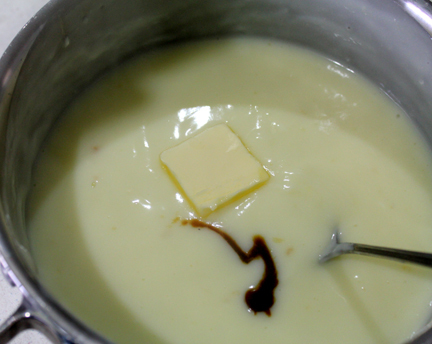 In a medium saucepan over medium heat, combine butter and water and salt. Bring to a boil. Add flour all at once, stirring vigorously. Cook and stir until mixture forms a ball that doesn’t separate. Remove from heat. Cool 10 minutes. Add eggs, one at a time, beating with a wooden spoon after each addition until smooth. Drop batter by heaping tablespoons, three inches apart, on a greased baking sheet (I lined mine with parchment). Bake for 30-35 minutes or until golden. Cool on a wire rack. Split puffs and remove any soft dough from inside . Fill with pudding, dust with sugar, serve and enjoy. You could also fill with whipped cream, ice cream, sherbet or fruit. 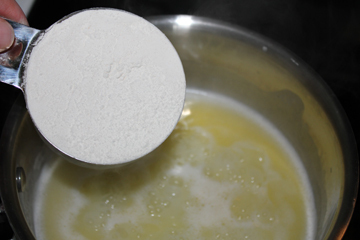 In a heavy 2 quart saucepan, combine sugar, cornstarch and flour. Stir in milk then cook over medium hit until mixture is thickened and bubbly. Stir constantly. When it starts to bubble, cook for two minutes more. 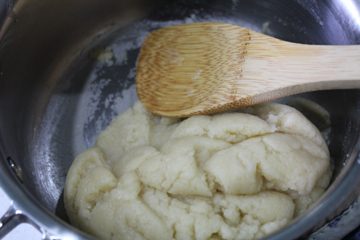 Remove from heat and gradually stir about one cup of the mixture into the beaten eggs. Return the egg mixture to the pan and cook until nearly bubbly but do not boil. Reduce heat and cook for two additional minutes, stirring constantly. Remove from heat, stir in butter and vanilla. Pour into a bowl, cover the top with plastic wrap, pressing it down to the surface of the pudding and chill until ready to serve cream puffs. If you are a chocolate addict like me, you can drizzle chocolate sauce over the top before you dust it with sugar. I’ve never made these, so I loved the step by step. They look really tasty.